This new LED lightshow tree features 14 animation sequences that automatically loop to create an amazing display. Animated effects include fades, strands of lights chasing around the tree, staggered fills, chasing twinkles and more. Installation is quick and easy, so you can have an incredible light show in just minutes! 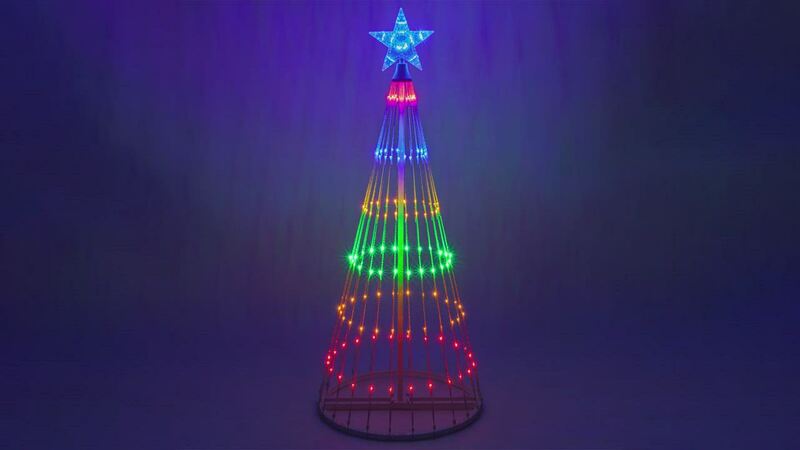 Make this animated Christmas tree the focal point of your holiday display and prepare to be mesmerized by the dancing lights! Available in a variety of sizes with energy saving multicolor LED lights. Product arrived on time and is awesome. Well made. I received a lot of compliments. I rarely write reviews, but these outdoor animated trees are awesome. Extremely easy to put together. Got it unpacked and assembled in about 20 minutes. The lights are clear, crisp and very appealing. Great, great product. I purchased the 6 foot tree also. Next year, I will be getting the 9 foot unit and maybe even another 4 and 6 footer. They add more beauty to my outdoor Christmas decorations!!! Exactly as described and as shown on site. A beautiful color display and it pops! It took minimal time to assemble. We will be ordering two more for our deck. I love this tree, it fits in perfectly with my other decorations. It came quickly and was easy for one person to set up - I set it up indoors and then carried it out. So far, it has survived a very windy California rain storm and a blackout. It is quite striking in appearance and the cost was very reasonable. I'm so glad I purchased it. The product works wonderful and is pretty easy to assemble. My only complaint is that the assembly instructions were not totally clear, seems that whoever made them speaks English as a "second" language and the details did not translate properly. Thank goodness there are a very few parts to assemble and a logic-minded person could assemble it by pure logic. The tree is beautiful. Adds a lot to our Christmas display. I highly recommend this product. This a great product. Easy to put together! Assembly was made unnecessarily difficult by having to push the wire through the center of the pole. The end of the wire was almost as large as the diameter of the pole and got stuck when trying to push it through. I had to use a bamboo stake attached to the wire to pull the wire through. The finished product is attractive, performs as advertised and is not as easily tipped over as other lawn ornaments. I haven't had it long enough to know if it will last, but it looks very nice on my dark street. My recommendation is to test the lights right away (seems obvious, I know). I assembled everything only to discover it was defective. With that said, the product does seem sturdy. The company immediately refunded me and that part was hassle free and much appreciated. We received this tree in mid-September. We put it up in the garage to make sure it worked before using it for our Christmas display outdoors. We were very pleased with the way the tree looks. The only negative is storing the tree after the holidays. The box it came in is not conducive to storing the tree. Fast shipping..Easy to set up..Great color!!! What a beautiful tree! I was shocked at how bright the lights were and the programming is awesome. They did so many different things. Its like those trees on light-O-Rama. You cant beat the price either. I admit that when I opened up box, I was a little skeptical. I suggest setting aside at least an hour to put it together, slow and steady. It will be worth the effort. Once assembled, I plugged it in and it was worth every penny and the time needed to put together. Just WOW at night! Easy to assemble and nice changing colors. This tree is the best in terms of quality, sturdiness and brightness. Definitely plan to buy other sizes for the next holiday season. We purchased three trees of different colors and the multi-color tree is the best. Looks great and the wind is not bothering it! Love these trees! Bought two 6' and one 12'! Only wish we could hook up them up to our stereo, but they are pre-programmed. I still highly recommend! Love it!!! Beautiful tree. Bought it to put outside and decided to keep it inside. Neighbors loved it too. I received my item in very good condition and before the expected delivery date. I have not used it for Christmas lighting yet, I ordered it after the Christmas season...But, i've tried it just to see how it works, it was a very nice tree for the price. I can't wait to put it out for next Christmas. The construction seems like this tree will last. the light pattern is eye catching and was an nice addition. When putting it together the first time just be patient.The wires are so twisted in the wrapping it takes time to get them all in place correctly. Lots of untangling at first. Spectacular little tree. Fabulous light display. Promptly arrived and easy to put together and set up. Couldn't be more happier. Appears to be sturdy construction. LED lights are very bright and operate on a continuous rotating pattern. I would recommend purchasing this tree. Love the Tree. Only problem is the clips that hold the string of lights break easy. My kids love this tree. It's a great product!!!! The tree is well built and has a colorful display. I like it very much, but wish it came with a controller so we can set the animation; we prefer a steady display. Beautiful tree! I was amazed at how great it looks! This tree is a newer version of a tree I used to have, except this tree has full cycles of continuous animation. LED lights keeps the electric bill down. Got this and set it up right away. Very good product! Thank you. This tree is awesome. It arrived early. Setup was easy and each night we have been enjoying the lightshow on our patio. We loved it so much that I bought the 12' for the front yard. We have had the 12' tree up for about a week now. Very happy with it. It is very bright and puts on a great show. I was a little skeptical with the structure while putting it up, but after all the connections are made, it appears to be very stable. We have it mounted on a dock, which gets very windy and it has done great. We were unable to get the lights to work as the top connector is a plug in - would be better as a screw-in connection so that it would better hold together. It came apart and we have not been able to put the cord back in the pole sections. The overall quality of this tree is much better than others I have bought from other companies. I'm sure that is will be beautiful when I get it put together. A great decoration piece for the yard.